It's Here at Last !!! PR 2400 CD Power Radionics Program for PC - The ultimate Radionics Program!!! Autogenic Training has been developed by Dr. Schultz who published the first book on the subject in 1932. Dr. Schultz recognized that during hypnosis the subject experiences various feelings such as warmth and heaviness. He went on to teach practices to self induce these feelings and, consequently, hypnotic states. From this self induction practice comes the name, Autogenic Training. Auto-genic means self created. In its practical application, Autogenic Training is a system of very specific auto suggestive formulas that have the purpose to relieve tensions, for stress management, and to alleviate psychosomatic disturbances, including many cases of insomnia, overweight, inability to concentrate, high blood pressure, constipation, skin problems, etc. Some people use Autogenic Training as an aid to meditation, concentration, and to keep their focus. You can also use Autogenic Training to create a receptive basis for very specific formulaized resolutions. These resolutions can be a decisive help in solving many of your challenges and in assisting you in many of your endeavors. Autogenic Training has been used successfully in Europe by millions of people in every walk of life for more than half a century. In Europe, Autogenic Training is taught mostly in doctors' offices, in hospitals, and in universities. One of the great advantages of Autogenic Training is that almost anybody except young children can learn it by just reading a how-to guide book as this one. It may be better, however, to practice with a group. More important, Autogenic Training can be mastered in a relatively short period of time. Most people become proficient in it in a matter of a few weeks by practicing two or three times daily for five to ten minutes. To practice Autogenic Training you need no physical exertion. It is self-generated in your mind. Methods related to Autogenic Training are Coueism ("day by day I am better and better"), progressive relaxation, Zen, and Yoga. Autogenic Training has more in common with yoga than with progressive relaxation. Dr. Schultz developed Autogenic Training in the first quarter of this century. He was drawing mainly from hypnosis and yoga. His first book, "Autogenic Training, Concentrative Self Relaxation," appeared first in 1932. You may then continue with formulaized resolutions that you repeat between ten and thirty times. Such formulas are very effective, because you repeat them during an altered state of consciousness. People who are under hypnosis experience usually two conditions: a feeling of heaviness and a pleasant feeling of warmth. Other feelings depend on the level of depth of the hypnosis. It is important to know that every hypnosis is in reality a self generated state of mind that is helped by the suggestions of a skilled hypnotist. Autogenic Training goes one step further than hypnosis. In Autogenic Training it is the subject who is also the hypnotist. With Autogenic Training you can self-induce the physiological conditions of hypnosis. Once you have induced the physiological conditions of hypnosis, the psychological conditions of this state follow naturally! Autogenic Training actually leads to deeper and more workable states of consciousness than most modern day hypnotists achieve in their subjects. This is so because most professional hypnotists use progressive relaxation as an induction method that brings their clients into a mere hypnoid (pre-hypnotic) state rather than a hypnosis. Usually they lack the skill to lead their subjects into deeper levels of hypnosis. Hypnoid states of consciousness lack the depth that is needed to cause significant change in the subject. In Autogenic Training the practitioner repeats formulaized resolutions instead of the positive suggestions that the hypnotist usually gives. The practitioner of Autogenic Training needs to be careful to formulate the resolutions correctly. The subconscious that is addressed with the resolution has the habit of taking things quite literally. You may also use Autogenic Training to enhance the suggestions on a self hypnosis tape. This is so because the state that you can reach with the method of Autogenic Training is much more receptive than the states that the progressive relaxation techniques on tapes can ever induce. An unspecified formula "... and you are getting deeper and deeper into a state of relaxation and hypnosis" does not always do the trick. From the above it becomes obvious that practice of Autogenic Training are very effective when you practice it while receiving the energy transfer from an orgone generator (Welz Chi Generator). It is a well established fact that certain brain frequencies, especially Alpha, Theta and Beta frequencies, will cause your brain to be more relaxed and receptive. This state of relaxation and intuitive insights is considerably stronger when you receive these frequencies as pulsed orgone (chi) energy. In fact, the practice of Autogenic Training will cause the brain to get into Alpha, Theta, even Delta states. When you receive the frequency as pulsed orgone, the adjustnment of your brain to the desired Autogenic state happens almost immediately! Adjust the frequency of your EPG to the desired level. Some people like exact frequencies, such as the 7.83 Hertz Earth Resonance Frequency. You can get these frequencies on the LPOM series and RAD 2400 series of the Welz Chi Generators. The latest device on the market is our Precision Module that allows you to set very exact brain wave frequencies. It comes with the heavy duty Welz Chi Generators. The benefits of this extraordinary new neurotechnology are mind boggling! It is the fastest way for you to master Autogenic Training and to use its techniques to help you getting results in your practices for Self Help, Neuro-Cybernetic Programming™ and Trend Management Techniques. Persons who have mastered Autogenic Training with the help of the Welz Chi Generator are familiar with methods of rapid induction of the Autogenic state. Once you have induced this Autogenic state, you may follow specific formulas that you design to induce any desired state of consciousness, even the most complex one. 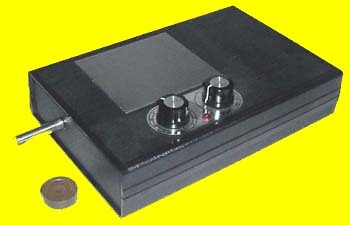 Presently, the best orgone energy devices to use for Autogenic Training are devices with the new Precision Modules. To learn Autogenic Training is very easy, especially when you enhance the practice with your orgone generator. All you need to do is sit or lie down comfortably and consistently repeat the formulas. Either put the generator close to you or you carry a transfer disk on yourself. If you believe in the power of the method, you have an added plus that enhances the speed of your learning process. However you need not have this attitude of believing. The method will show success rather rapidly. As a result of such direct evidence you will develop an unshakable confidence in the practice of Autogenic Training. Results motivate much better than thousands of words ever can. As a beginner you should practice Autogenic Training two or three times every day, five to ten minutes every time. Ideal times are before you go to sleep and right after you wake up. To begin the day with Autogenic Training can be source of well being for the whole day. This practice can help you attain and maintain your perspective. You should use the same formula if you practice anywhere you do not want to fall asleep. Of course, you should never practice when driving a car! A systematic and precise training plan can bring you the most powerful results and benefits of Autogenic Training. Therefore it is very important for the beginner of this practice to set up an exact time schedule for practicing Autogenic Training. The beginner should then follow this schedule as closely as possible. You may use some freedom of action, especially when you are not used to live by a fixed time schedule. However, for the majority of those who learn the system, it is best to time the exercises precisely right from the beginning. You will discover for yourself the best time to practice Autogenic Training. Most people do their last exercise shortly before they go to sleep. This has many advantages, especially for people who are suffering from insomnia of some kind or another. To practice every evening is absolutely necessary for the beginner. If you practice before you go to sleep, you should plug your EPG (Welz Chi Generator) into a timer. To begin your day with Autogenic Training can be a source of emotional and physiological well being. Anyone who thinks that he or she cannot afford five or ten minutes of practice may live under such pressure that developed this illusion. Usually the same person does a lot of things every morning that waste a lot more time. Particularly in the morning you should not allow to be driven by false ideas. To practice Autogenic Training in the morning can help you begin your day without tension and to attain and maintain your perspective for the whole day. I an staying awake and alert while training. Insert this formula several times during your practice. You may also use the same formula when you are practicing in a place where you do not wish to fall asleep. The more regularly you practice, the more easily you will experience the desired results and the faster will you be able to advance to a practical use of the method. As you advance, the practice of the six basic formulas will bring results faster and faster. Later you will learn how to shorten the formulas for your convenience. Eventually you will know to enter the state of Autogenic Training at a simple command that you utter mentally. If you have the opportunity to do so, it is beneficial if you practice in a slightly darkened room that is not overly warm. You should keep the windows closed to keep out undesirable and disturbing noises. You have more difficulty to practice with a full stomach. Stimulants such as coffee increase the difficulty to concentrate. The ability to concentrate is essential in the practice of Autogenic Training. However, as you proceed with your practice you will strengthen your ability to concentrate. Special formulaized resolutions will enhance the capability to concentrate even more. You should practice any relaxation exercise in a relaxed position. Any relaxed position will do. Sometimes it is necessary to adjust to circumstances. To get into this position you sit down into a chair. When using the EPG, be sure to carry the transfer disk on you – or point the EPG directly at you. First you straighten your back, then you slump down. Make sure that there is no pressure on the stomach, i.e., do not bend forward too far. In this position the head hangs loosely forward. The hands rest relaxed on the thighs. The upper arms are supporting the weight of the head and upper body. The hands should not touch each other, because this may create a diversion. Both feet rest flat on the floor. The eyelids are closed. The tongue is loose and heavy. The jaws are slack although the mouth need not be open. Most people prefer to exercise while lying on their backs and with their heads slightly raised. In this position the elbows are slightly bent, the palms of the hands rest next to the thighs or slightly angled away from the body. You may put a pillow under the shoulders. The feet should point slightly outward. If they point upward, this means that you are not relaxed. Not everyone finds it easy to practice while lying on the back. When you decide to practice before you are going to sleep this latter position is ideal, because you may slide into sleep while training. For beginners it is better not to use the Welz Chi generator when practicing before going to sleep or to plug it into a timer. The successful switching from tension to relaxation determines whether we feel well. The person who is gripped by physical tension and cramped muscles will also be psychologically cramped. Such a person's relation to the world around will also be beset with tension. Unhappiness, physiological problems and failures may result. Tensions are always part of life. But today it seems to be more difficult to relax than ever before. Although tension is necessary, even beneficial, in many situations of life, indiscriminate and chronic tension is not. Everyone reacts differently to states of tension. But every sickness also leads to an increase in tension that can have physical, psychological, and social effects. We all know people whose constant state of nervousness irritates us. Such people are in a permanent state of excessive tension. People wear a mask, i.e., they are in a permanent state of tension. These people have chronic muscle spasms. Wilhelm Reich called this the muscular armor. This armor is at the root of much malfunctioning on all levels: of our bodies and in our personal and social relationships. Autogenic Training can be a significant help in easing, even dissolving, the armoring of a person, especially when supported by an orgone (chi) generator. You should practice the relaxation method that is inherent in Autogenic Training in your own self interest. It leads to states of relaxation that are much deeper that you can ever reach with methods of progressive relaxation, even hypnosis that is induced by others. By turning your attention to your own body you will not only learn that you have a body, but also that you are body. According to Dr. Schultz, you must slip passively into the physical experience of your body. You must transport yourself into the organ that you wish to influence. This has nothing to do with willpower, because successful autosuggestion takes place without the exertion of the will and its consequent interference. Violation of this principle may produce paradoxical effects. Consider the following: Anytime you absolutely want to fall asleep or try to force this, you will find falling asleep is more difficult, even impossible. Some persons find it difficult to distinguish between concentration, i.e., the focus on specific ideas, images, etc., and the personal will that is always related to active tension. The practitioner who is 'willing' certain things is less effective than the practitioner who 'is setting a focus' on the same things. Your complete abandonment to the content of the formulas that you use in your practice is in a way a form of abandonment of your will, even of forgetting yourself. It guarantees the success of your practice. Anyone who can learn how to relax during Autogenic Training will become relaxed in general.